DL4YHF published a frequency counter design based on the PIC16F628. The design has been modified by many, copied by even more, and usually without attribution. 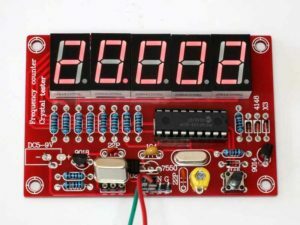 This article documents one of these copies (TB-244756 printed under the chip footprint), a $6 kit off eBay which comes with no documentation, though the screen mask is enough to correctly place components. It turns out to be DL4YHF’s “DISPLAY_VARIANT 2”, the variation is that it uses a common cathode display. Above the built kit with the 7550 voltage regulator replaced with a 78L05. Above, the underside of the PCB. Well it just worked… for a minute. It drew 20mA from a 9V supply, but in less than two minutes current shot up to 230mA. The cheap Chinese 7550 voltage regulator had failed. It was replaced with a 78L05 (different pinout which explains the wiring configuration shown in the pic above). On test, the 78L05 stands 24V DC input without reaching thermal limiting temperature. To calibrate the counter, a 20MHz crystal was plugged into the xtal socket for a convenient source, and a receiver used to find the frequency of the counter’s own 20MHz oscillator and the plug in crystal (accurate SSB rx on 19.999MHz USB, and audio output beat measured with another counter). The trimmer was adjusted to put the counter’s oscillator within 5Hz of correct. At this point the counter displayed 20.016, but the xtal was oscillating at 20.0014MHz… so the firmware is clearly defective. In the midst of this process, the power save timeout was annoying and attempts to activate the menu and disable it proved fruitless, another firmware problem. The clever Chinese copyists who copied this stuff have protected the PIC chip from reading so it is not possible to download the firmware for archive or comparison with other versions. Having worked through the hardware variation, DL4YHF’s original code was modified to create a hex file to suit the hardware. Recalibrating the counter oscillator (as it was now a different chip), the display of the plug in crystal freq is correct, and the menus work so that the power save can be disabled. The 7550 regulator failed within two minutes, the firmware gives inaccurate readings and does not have the menu facilities that were in the 2006 update, so it is stale and broken. The board and other components were quite good. 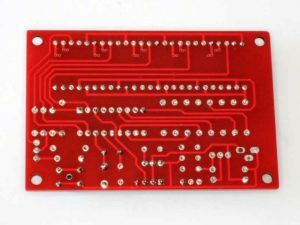 A wipe of liquid flux over the clean board made soldering easy. 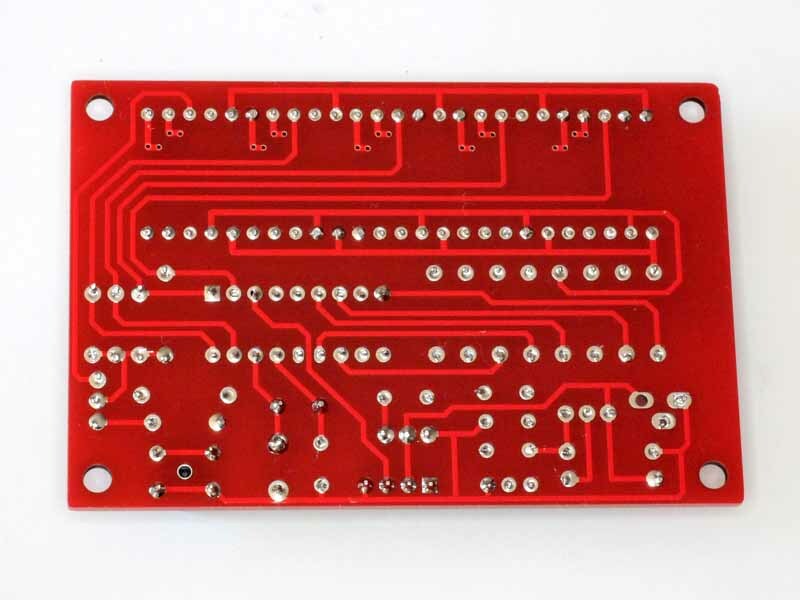 PCB holes were a little large, but that is better than being too small (which is too common in cheap kits). The kit was easy to assemble but had flawed firmware that gave inaccurate results, and was short of the menu facility and all the features that flow from it. It is plainly Chinese Quality. The good news is that these problems can be overcome by programming the PIC chip with the more recent (2006) firmware modified for the hardware configuration. If you don’t have the means to update the chip firmware, you should skip this one. It is a fun little kit that with fixed firmware, works nicely and a credit to DL4YHF, the concept designer. The updated source and hex are available at https://bitbucket.org/owenduffy/dl4yhfctr .